Have you ever wondered just after you’ve covered a few dozen miles towards your vacation destination, whether you forgot to turn off your stove? Yup, me too. Only recently did I realize that my old electrical stove has a peculiar “feature” which makes it a bit easier to verify with a quick glance that it is fully switched off. With one exception, all of its dials have seven snap-into-place positions, so that there is just one position in which a dial’s handle has a perfectly vertical orientation, and that is “off”. The exception is the dial for setting the oven’s temperature. It rotates freely and, therefore, can be set to either of two vertical orientations. This is no big deal, however, because that dial only works in combination with the one right next to it, which controls the oven’s mode of operation. This one again offers seven positions, with the single perfectly vertical one indicating “off”. All it takes to check whether the stove is completely switched off, then, is to see that all of its dials’ handles are oriented vertically. 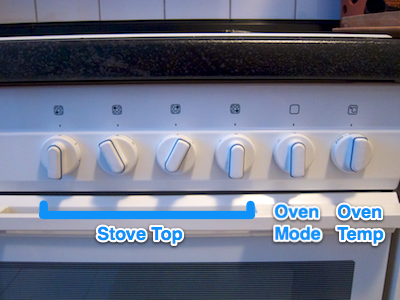 The stove does have two status lights on the front panel, one for the stove top and one for the oven. Nevertheless, I have found it to be easier to visually take in the dials’ positions than to recognize whether any of the two lights is on — especially in those “from the corner of my eye” moments just before getting out the door.